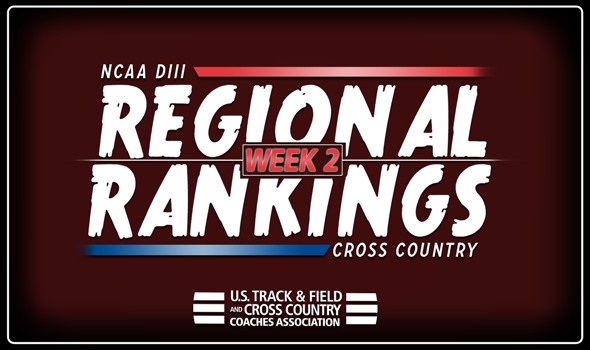 NEW ORLEANS – The winds of change are starting to blow through the NCAA Division III Men’s and Women’s Cross Country Regional Rankings. Out of the 80 combined teams that are listed in the top-5 of the men’s and women’s rankings, 28 shifted spots between Week 2 and Week 3. Expect a lot more in the coming weeks. The USTFCCCA Regional Cross Country Rankings are determined subjectively by a single member coach in each respective region. The regional representative is tasked with weighing returning teams’ strength with current season results (if applicable) in determining predicted team finishes at the NCAA Regional Championships, which will take place November 10, one week ahead of the NCAA Championships in Oshkosh, Wisconsin. There was one change to the top-5 of the men’s rankings: Ithaca climbed four spots from No. 9 to No. 5 this week. The Bombers, who now sit behind top-ranked RPI, No. 2 SUNY Geneseo, No. 3 RIT and No. 4 St. Lawrence, finished a game runner-up to the Knights at the Yellowjacket Invitational this past weekend. There were no changes to the top-5 of the women’s rankings: SUNY Geneseo remains No. 1, followed by No. 2 RPI, No. 3 TCNJ, No. 4 St. Lawrence and No. 5 Hamilton. Carleton and Wartburg are still No. 1 and No. 2 in the men’s rankings, but St. Olaf made a push to No. 3 this past weekend. The Oles pulled together and finished a strong runner-up to UW-La Crosse at the Augsburg Invitational 43-49. With St. Olaf moving up, it pushed Cornell College and Loras each down one spot to No. 4 and No. 5, respectively. The women’s rankings are similar to the men’s with Carleton on top, but a few things changed behind it. Wartburg and Nebraska Wesleyan both moved up one spot to No. 2 and No. 3, respectively, while St. Olaf climbed from No. 6 to No. 4. St. Thomas (Minn.) dropped three spots from No. 2 to No. 5. The only change to the top-5 of the men’s rankings was Case Western Reserve jumping four spots from No. 9 to No. 5. The Spartans used a 37-second spread between its top-5 runners to finish runner-up at the Allegheny Classic this past weekend. Calvin is still No. 1, followed by No. 2 Albion, No. 3 Otterbein and No. 4 Trine. There were some big changes in the top-5 of the women’s rankings as Hope soared from No. 3 to No. 1 and Case Western Reserve jumped from No. 7 to No. 3. The Flying Dutch have been a fixture atop the Great Lakes Region in the past three years (15 weeks at No. 1) and proved why this past weekend with a sterling effort at the Gil Dodds Invitational, where they beat several teams ranked ahead of them in the national poll and had a five-second spread between their No. 2 and No. 5 runners. The Spartans were buoyed by a runner-up effort at the Allegheny Classic. There were no changes to the top-5 of the men’s rankings this week: Haverford is still No. 1, followed by No. 2 Carnegie Mellon, No. 3 Johns Hopkins, No. 4 Dickinson and No. 5 Stevenson. The top-3 teams in the women’s rankings are the same with Johns Hopkins at the front of the line, trailed by Dickinson and Carnegie Mellon. Swarthmore climbed three spots from No. 7 to No. 4, while Haverford fell from No. 4 to No. 5. The Garnet had a strong showing at the Mainline Invitational this past weekend. North Central (Ill.) is still the top-ranked team in the men’s ballot, but there were some changes behind it. Washington (Mo.) took over the No. 2 spot from UW-La Crosse (now No. 3) after the former impressed at the Gil Dodds Invitational. The Bears scored just 19 points in a 17-team meet and the spread between its No. 1 and No. 5 runners was four seconds. U of Chicago took third place at the Gil Dodds Invitational and moved up to No. 4 in the region, while UW-Stout rounds out the top-5 this week. Washington (Mo.) headlines the women’s rankings once again, yet saw some changes in the rest of the pack. UW-La Crosse climbed from No. 4 to No. 2 after a runner-up effort at the Augsburg Invitational that saw it beat a number of NCAA Division III teams. UW-Eau Claire is No. 3 and is followed by Wheaton (Ill.) and U of Chicago. There were no changes to the top-5 of the men’s rankings: Amherst is still No. 1, followed by No. 2 MIT, No. 3 Middlebury, No. 4 Williams and No. 5 Connecticut College. We should see some changes between Week 2 and Week 3 since the always-competitive Purple Valley Classic is held this weekend. There was one change to the top-5 of the women’s rankings: Brandeis is the new No. 5 after switching spots with Bates. MIT is No. 1, followed by No. 2 Middlebury, No. 3 Williams and No. 4 Tufts. There were no changes to the top-5 of the men’s rankings: Rhodes is still No. 1, followed by Emory, Christopher Newport, Washington and Lee and Bridgewater (Va.). The biggest change in the women’s rankings was Centre moving up two spots from No. 4 to No. 2 after finishing as the top NCAA DIII team at the Rhodes Invitational this past weekend. Emory sits above the Colonels, while Lynchburg, Trinity (Texas) and Washington and Lee round out the new top-5. A few changes rocked the men’s rankings in Week 2 following the results of the UC Riverside Invitational. Pomona-Pitzer looked strong and remains No. 1, but Claremont-Mudd-Scripps put three runners in front of UC-Santa Cruz’s top runner and swapped spots with them in the rankings. Occidental is No. 4, followed by George Fox, which jumped from the unranked level to No. 5. There weren’t many changes to the women’s rankings: Claremont-Mudd-Scripps is still No. 1, followed by Pomona-Pitzer and Colorado College. UC-Santa Cruz is now No. 4 after being unranked the first three weeks of the season. Occidental rounds out the top-5.